"Corrogated" profile also known as "Corro" or "Custom Orb" or "Corrodek"
"Trimdek" profile also known as "Steelclad" or "Trimclad"
"Kliplok" profile also known as "Lokdek"
Your roof type determines the width and accessories which we would need to supply you for the job. Tile roof will require 500mm wide mesh, Colorbond trims and screws. 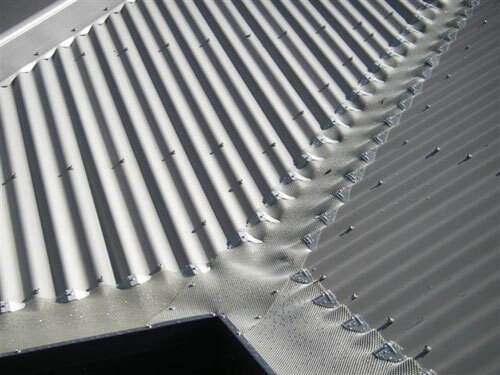 Whilst metal roofs, like Corrogated and Trimdeck require 250mm wide mesh, special Colorbond Clips, Trims and Screws. 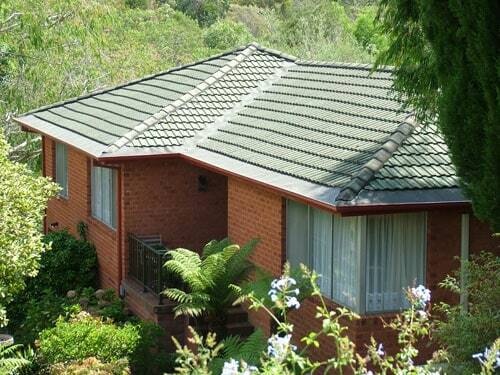 During bushfire season it is critical that all your gutters are clean from leaves & debris. The quickest and easiest way a house can be engulfed with flames occurs when flaming embers (the little pieces of lit fire particles which travel in the air) come to rest in your gutters. Once the embers make contact with dried old leaves and debris then its blazing glory. Within in minutes the roof is a light and the house is destroyed. Flaming embers can travel up to 5 kms ahead of a bushfire. To ensure that this problem does not happen to you and you do not become another statistic, ULTRAGUARD have developed the UltraGuard Aluminium Mesh & MetalGuard which once fitted will work to eliminate the build up of leaves and debris in your gutter system. The new standards and building regulations have also introduced the need for all bushfire prone buildings to be guarded using an ember guard. Ember guards and Aluminium leaf guard are two different products for different applications and should not be confused in determining compliance with the standards & codes. Ember Guards are not designed to act as a leaf guard, and leaf guards are not designed to act as ember guards. With the exception of being non-combusitble there is no other requirement of a leaf guard product. However ember guards need to be non-combustible but also have to be of a special hole gauge of less than 2mm. If you only need Gutter Guard protection for your Valleys select the option "Only Valley". If you need protection for only your Gutters select "Only Gutter". If you want Gutters and Valleys to be protected select the option Gutter and Valley. The colour of your roof helps us determine the best colour match of mesh, clips and screws. We have the widest range of colours in the industry. Our colours are perfect matches for Colorbond colours. 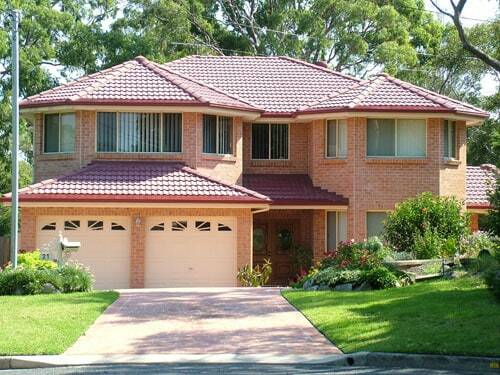 The colour of your gutter helps us determine the best colour match of mesh, trims and screws. We have the widest range of colours in the industry. Our colours are perfect matches for Colorbond colours. Please Select the estimated width of your tile roof valley. Final price will appear upon check out. Answer a few simple questions to get a list of Materials & Online Quote. Used for all BAL levels. Fine 2mm x 2mm hole size. Perfect Hole size allowing maximum water in and most leave and debris out. Used to secure the mesh to the gutter edge. Our system is an award winning system which has been proven & tested for over 20 years in Australia's harshest environments. The system will provide years of CLEANER SAFER GUTTERS. Ski slope effect ensures that all leaves & debris simply slide off your roof with gravity. No place for birds or pest to enter or rest in your gutters. No more fears of bushfire & ember attack as the mesh if fire proof and will prevent any dry material building up in your gutters keeping them clean and empty. 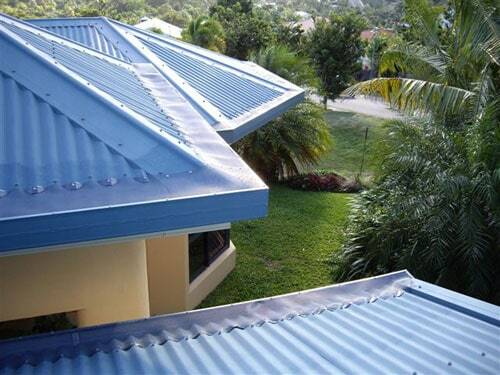 Provide full roof protection. We protect the gutters and the valleys on all types of roofs. UltraGuard Gutter Protection is a permanent solution that ensures that your gutters are always leaves, pests and debris free. Don't trust anyone else but UltraGuard to have the best gutter guard solution for your gutters. We offer plastic and aluminium gutter guard suitable for all roof types and budgets. Why spend more than you should on your gutter guard solution? We will promise to beat any competitor offer for the same product. UltraGuard provides you with the most cost effective option for your home. Have peace of mind with the UltraGuard Best Price Guarantee. Weather you are a Roofer, Handyman or any other Tradie, buying wholesale from UltraGuard gives you the potential to earn big profits today! Our trusted brand and ease of installation will help you grow your business. UltraGuard Aluminium Mesh has been tested by the CSIRO and has passed AS1530.2, which means the mesh is classified as a NON COMBUSTABLE leafguard and conforms to AS3959:2009 Bushfire Building Code. Before you make your decision to buy gutter guard it's highly recommended that you read the brief which we have prepared for our customers so they can be better informed and buy with confidence that they are getting the best product & solution at the best price. Download Here!